Yucca root (Manihot esculenta) is a starchy, sweet, and nutty-flavored root vegetable. It is also spelled yuca, and goes by other names such as cassava root, Brazilian arrowroot, and mandioca. Yucca root is native to South America, but is also found in South Asia, Africa, and the Caribbean. From a health perspective, some research suggests yucca root benefits the immune system and skin health, inhibits oxidative stress, and treats those with arthritis and diabetes. In this article, we’ll discuss yucca root nutrition facts, health benefits, and the risks and precautions associated with this root vegetable. Read on to also learn more about how to use the veggie with some tasty yucca root recipes. The wide array of yucca root health benefits can be attributed its impressive nutrient content. For instance, yucca root is particularly high in carbohydrates. After maize and corn, yucca root is considered the third largest carbohydrate source in the tropics. Yucca root is also an excellent source of protein, fiber, vitamin C, manganese, potassium, magnesium, folate, and vitamin B1. Yucca root also contains minerals such as iron, copper, calcium, phosphorus, selenium, and zinc. From a vitamin perspective, you will also find vitamin B2, vitamin B3, vitamin B6, vitamin A, vitamin E, vitamin K, choline, and betaine in the root. The following is a comprehensive yucca root nutrition chart with information for one cup, or 206 grams, of the raw vegetable. There are a number of potential health benefits of yucca root. It’s been used to treat migraine headaches, high blood pressure, high cholesterol, digestive disorders like colitis, poor circulation, gallbladder and liver disorders, and bleeding. In this section, we cover five yucca root benefits, including its impact on the immune system, skin health, and oxidative stress, as well as how it treats diabetes and arthritis. Yucca root is loaded with antioxidants, especially vitamin C. Vitamin C is able to stimulate the activity and production of white blood cells, which can help the body fight and protect itself against illness and infection. In one study published in the journal Annals of Nutrition & Metabolism in 2006, researchers found that getting enough vitamin C could help decrease symptoms and shorten the duration of infections like the common cold, the flu, and pneumonia. The antioxidants in yucca root can also help fight free radicals and protect against oxidative stress to prevent damage to immune cells. Research suggests that antioxidants may protect against various chronic conditions, such as heart disease, diabetes, Alzheimer’s disease, Parkinson’s disease, and cancer. Research published in the journal Toxicology and Industrial Health in 2013 found that yucca supplements significantly reduced damage from oxidative stress in mice. The researchers also discovered that yucca root had a protective effect against the degeneration of multiple organ tissues, such as kidney, liver, brain, and heart tissue. Although yucca root is a high-carbohydrate food, it is still beneficial for blood sugar control and diabetes. This is because yucca root has a low glycemic index (GI) of 46. Foods with a glycemic index of 55 or less will raise blood sugar levels slowly. In comparison, foods with a high GI of 70 and above will increase blood sugar levels rapidly. For instance, boiled potatoes have a GI of 78 and white rice has a GI of 73. One 2013 study published in the African Journal of Biochemistry Research in 2013 found that yucca regulated metabolic disturbances and moderately reduced blood sugar levels in diabetic rats. Native Americans have long used yucca root to relieve osteoarthritis and rheumatoid arthritis symptoms. The anti-inflammatory properties in yucca root are able to soothe pain. Yucca also contains specific nutrients that may help reduce arthritis symptoms. Specifically, the manganese, saponins, and antioxidants in yucca root could reduce your risk of arthritis. Research shows that people with rheumatoid arthritis had significantly lower antioxidant concentrations than people without arthritis. A study published in the Journal of Inflammation in 2006 suggested that yucca root can prevent arthritis in people with the condition. Yucca root benefits skin health, and has been shown to protect against sun damage better than some commercial sunscreens. You will also find yucca extract in soaps, shampoos, and lotions, where it has been used to treat various skin conditions, such as sprains, dandruff, sores and cuts, baldness, and skin infections and diseases. Yucca also contains a variety of nutrients that benefit skin health. For instance, the high amount of vitamin C in yucca root can help with the production of the main skin protein called collagen. The folate in yucca root is also able to improve eye health and the skin overall. Although yucca root has many health benefits, there are also a number of precautions and risks to consider. Yucca is generally considered safe; however, some people may be allergic to it. Proper preparation is also key when consuming yucca root. This is because it contains a substance that can trigger production of toxins like cyanide. As a result, improper cooking of yucca root can cause stomach pain, vomiting, headaches, and dizziness. You will also want to consume sweet yucca rather than bitter yucca. Peel yucca, cut it, and cook thoroughly. Soaking yucca for 48 to 60 hours before cooking can also help cut down on toxicity. Moreover, yucca supplements can sometimes cause side effects, such as nausea, vomiting, upset stomach, and a bitter taste in your mouth. There are no known drug interactions with yucca supplements. That being said, yucca can interfere with the body’s absorption of fat-soluble vitamins. You should also only take yucca supplements for three months at a time. There are numerous yucca root uses. For example, yucca tastes a lot like potatoes and is often ground up into powders and flours and used in baking. You will often find yucca alongside other tubers like yams and sweet potatoes in the produce section of your local grocery store. You may find it pre-peeled and cut in the freezer section as well. Popular ingredients made from yucca include arrowroot and tapioca flour. There are countless yucca recipes, and the roots can be used in the same way as potatoes to make chips, fritters, or fries. You can also boil and mash yucca root, or make a soup or stew. In this section, we have provided a few yucca root recipes you can try for yourself. Preheat the oven to 450 degrees Fahrenheit. Peel yucca root with a vegetable peeler to remove its waxy skin, and chop it in half and slice it into fries. Place the sliced yucca into a large pot filled with filtered water. Bring the water to a boil, and cook for eight to 10 minutes. Once yucca has cooked, strain it and rinse with cold water. Place the yucca in a large bowl, and mix with oil, salt, pepper, chili powder, and oregano. Place on a parchment paper-lined baking sheet, and bake yucca for 15 minutes. Remove from oven and flip them. Put them back in the oven, and cook for 15 more minutes. Serve yucca fries warm. Peel the yucca root, and remove the skin and gray veins. Your yucca should be completely white. Cut it in half lengthwise, and then in thirds. Place the yucca in a large stockpot, and cover it with filtered water. Add the mashed garlic. Boil the garlic and yucca root for 25 to 30 minutes, or until it is tender. Drain and return to the pot. Add the butter, pepper, salt, and one-half cup of coconut milk, and mash the ingredients together. Add the rest of the milk if the yucca mash is too dry. Garnish the yucca mash with cilantro. Serve warm. Heat the oil in a large pan, and add the garlic and onion. Stir and fry until the onion is cooked for about three to five minutes. Add the yucca root and sweet potato, and keep stir-frying for three minutes. Add the spices and broth, and cover and cook on low heat until the sweet potato and yucca are soft. This will take at least 35 to 45 minutes. Mash the sweet potato and yucca root to create a thicker broth, and add coconut milk to make the soup creamy. Serve in a bowl, top with cilantro, and enjoy. Yucca root has long been a staple in the diets of people native to South America, the Caribbean, Africa, and Mesoamerica. Today, yucca root is used to make chips, fries, fritters, mashed yucca root, and soups and stews. Yucca can also be made into arrowroot and tapioca flour. 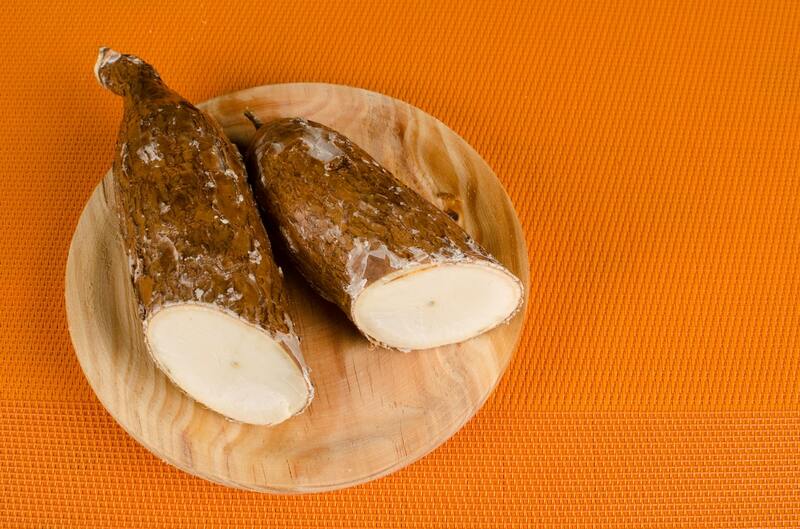 Yucca root is high in carbohydrates, and is one of the largest carb sources used in the tropics. Yucca is also high in vitamin C, potassium, magnesium, manganese, folate, vitamin B1, and fiber. As a result, it’s thought that yucca root benefits people with diabetes, arthritis, and skin problems. Yucca may also boost immunity and inhibit oxidative stress. “Cassava, raw,” Nutrition Self Data; http://nutritiondata.self.com/facts/vegetables-and-vegetable-products/2389/2, last accessed August 16, 2018. Wintergerst, E., et al., “immune-enhancing role of vitamin C and zinc and effect on clinical conditions,” Annals of Nutrition & Metabolism, 2006; 50(2): 85-94, doi: 10.1159/000090495. Ince, S., et al., “Dietary Yucca schidigera supplementation reduces arsenic-induced oxidative stress in Swiss albino mice,” Toxicology and Industrial Health, Nov. 2013; 29(10); 904-914, doi: 10.1177/0748233712446730. Oztasan, N., “The effects of Yucca schidigera on blood glucose and lipid levels in diabetic rats,” African Journal of Biochemistry Research, Oct. 2013; 7(9): 179-183, doi: 10.5897/AJBR2013.0719. Jaswal, S., et al., “Antioxidant status in rheumatoid arthritis and role of antioxidant therapy,” Clinica Chimica Acta, Dec. 2003; 338(1-2): 123-129, PMID: 14637276. Cheeke, P.R. et al., “Anti-inflammatory and anti-arthritic effects of yucca schidigera: A review,” Journal of Inflammation, March 2006; 3: 6, doi: 10.1186/1476-9255-3-6. “Crispy Baked Yuca Fries,” The Healthy Maven, March 17, 2015; https://www.thehealthymaven.com/2015/03/crispy-baked-yuca-fries.html, last accessed August 16, 2018. “Garlic Mashed Yucca,” Querica Vida; https://www.quericavida.com/recipes/garlic-mashed-yucca/883130ce-9303-4f37-9c8d-0245a3edfe18, last accessed August 16, 2018. “Yuca and Sweet Potato Soup,” Doctor Yum; https://recipes.doctoryum.org/en/recipes/yuca-and-sweet-potato-soup-97482, last accessed August 16, 2018.